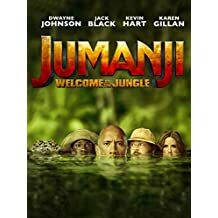 Only had time for one movie this weekend and we had to make it fit within a tight window, so we saw a movie we weren’t relaly stoked about - Jumanji: Welcome to the Jungle. We both love The Rock, have enjoyed his other films, and we laughed hysterically at Central Intelligence which also featured Kevin Hart. So we knew we’d laugh but we weren’t sure of much else. We also really liked the original, so now I wonder why this wasn’t higher on our list. You don’t get in water with a backpack, everybody knows that. Anyway, it was a fun movie that turned out to be much better than we expected. I assume it’s pretty hard to pull of a sequel twenty years after the original and if you ask me, this one succeeds. There was enough silliness to keep everyone shaking heads, plenty of well-done humor, feel good vibes, and a not-too-preachy message about friendship. The action scenes and scenery might make it worth a visit to the big screen, but it’s probably safe to save it for home viewing. We always only have one life, man. That’s how it is.